ROME, Jul 25 2016 (IPS) - No longer it is about restoring the legitimate rights of over 370 indigenous peoples spread across 70 countries worldwide, many of them living in dire situation, but now about their central, critical role in combating climate change. Victoria Tauli-Corpuz, the United Nations Special Rapporteur on the Rights of Indigenous Peoples has relentlessly emphasized this new reality. “It’s a dire situation in terms of respect for the rights of indigenous peoples,” she told the participants in the United Nations Food and Agriculture Organisation’s Committee on Forestry (COFO) which met in the Italian capital on July 18-22. “Indigenous peoples across the world experience the consequences of historical colonisation and invasion of their territories, and face discrimination because of their distinct cultures, identities and ways of life,” according to UN Special Rapporteur on the Rights of Indigenous Peoples. Specifically, René Castro Salazar, FAO’s Assistant-Director General warned that the issue of indigenous rights to land and territories was ‘critical’ for the success of climate change initiatives. A third of global forests are under some form of management by families, smallholders, local communities and indigenous peoples, and represent some of the most important carbon stocks in the world, FAO reported during the meeting. Government-recognised community forests alone hold an estimated 37.7 billion tonnes of carbon stock. 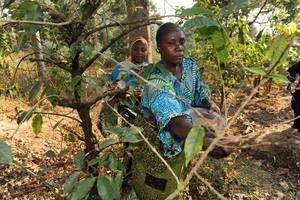 “Family smallholders, local communities and indigenous peoples have a key role to play in preserving these carbon stocks by reducing deforestation, managing forests sustainably and restoring tree cover as part of productive rural economies, particularly when they belong to strong producer organisations,” according to the UN agency. 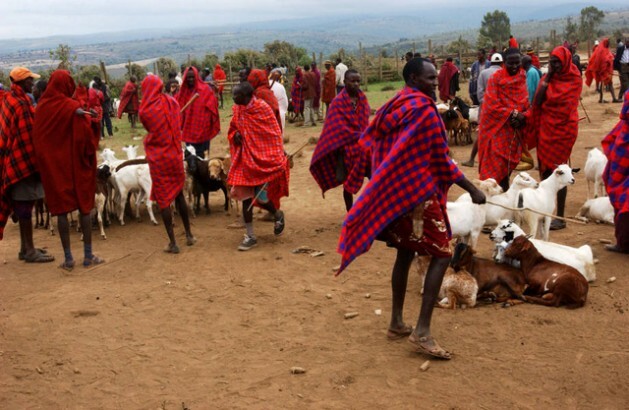 They also called on global financing mechanisms, government programmes and private investors to direct investment and support towards local communities, indigenous peoples, smallholders and producer organisations. On the occasion of the Rome meeting, FAO issued a new study that helps to fill a significant knowledge gap on the presence and extent of forests and trees in the world’s drylands, where the food security and livelihoods of millions of people, already precarious, are increasingly being threatened by climate change. The study’s preliminary findings show that trees are present with hugely varying densities on almost one-third of the world’s 6.1 billion hectares of drylands, which cover an area more than twice the size of Africa. Almost 18 per cent of this area contains forests. An estimated 2 billion people, 90 per cent of whom are in developing countries, live in drylands. Recent studies have indicated the need to restore these areas to cope with the effects of drought, desertification and land degradation. 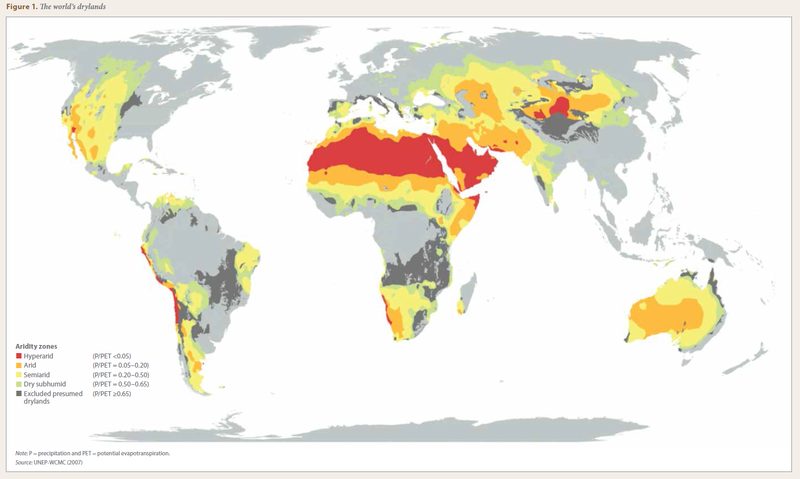 In particular, water availability in drylands is expected to decline further due to changes in climate and land use, the new study warns. Until now, there has been little statistically based knowledge on dryland trees –particularly those growing outside forests– despite their vital importance to humans and the environment, according to the study. Drylands are divided into four aridity zones (see map): the dry sub-humid zone, is the least arid of the four zones and consists mostly of the Sudanian savanna, forests and grasslands in South America, the steppes of eastern Europe and southern Siberia, and the Canadian prairie. Most dryland forests occur in this zone, as do some large irrigated, intensively farmed areas along perennial rivers; at the other extreme, the hyper-arid zone is the driest zone and it is dominated by desert – the Sahara alone accounting for 45 per cent, and the Arabian desert forming another large component. • The global drylands contain 1.11 billion hectares of forest land, which is 27 per cent of the global forest area, estimated at approximately 4 billion hectares. • Two-thirds of the drylands forest area can be defined as being dense, meaning it has closed canopies (i.e. a canopy cover greater than 40 per cent). • The second most common land use in drylands is grassland (31 per cent), followed by forest (18 per cent) and cropland (14 per cent). The category other lands constitutes 34 per cent of the global drylands area. • The least-arid zones have the most forest. The proportion of forest land is 51 per cent in the dry subhumid zone, 41 per cent in the semiarid zone, 7 per cent in the arid zone and 0.5 per cent in the hyperarid zone. The average crown cover density is ten times higher in the dry subhumid zone than in the hyperarid zone. • Trees outside forests are present on 1.9 billion hectares of drylands (31 per cent of the global drylands area), if all land with more than 0 per cent crown cover is included. Thirty per cent of croplands and grasslands have at least some crown cover, as do 60 per cent of lands classified as settlements.